Your children’s present diet pattern will have a strong impact on their health for the rest of their lives. Children require a variety of nutrient-rich foods such as fresh fruits and vegetables, whole grains, fish, meat, grains and legumes and dairy products in order to support optimal growth and development. But for working moms and dads, cooking up healthy elaborate breakfast, lunch, dinner and snacks for the kids can be a daunting task. Therefore, in this article, we have complied 25 healthy and tasty no-cook recipes for breakfast, meals and snacks that does not involve any baking or cooking but still taste delicious. The parents can prepare most of these breakfast and meals the day before and pack a fun lunch or snack for school. This is a simple and quick no-cooking lobster roll recipe that makes a delightful snack as well as a complete meal for your kids. It is packed with healthy lobster meat and fresh greens that makes it absolutely filling. You can regulate the spices and decrease the amount of black pepper and hot sauce or leave it out completely if your kids are not into spicy foods. The minimal use spices and oil helps to keep it light and simple. Inclusion of fresh greens such as celery and lettuce provides dietary fiber along with vitamins and minerals that improve digestion, strengthen the immune system, protect the nerves and cures respiratory conditions. Crab meat is a rich source of long chain omega 3 fatty acids that aid brain development. The proteins in crab meat promote the formation, growth and recovery of muscles and tissue. This non-spicy and delicious Caprese Stuffed Tomatoes are a quick and easy variation of the classic Caprese salad with will be loved not only by your kids but the whole family. The combination of tangy tomatoes and creamy mozzarella will surely surprise your kid’s taste buds and the healthy dose of calcium, protein and other nutrients from the mozzarella will support their overall health. This is yet another low-spicy and low-oil recipe that is absolutely light and delightful. The use of herbs instead of spices enhances the flavors of the salad without adding fire to it. Mozzarella is a rich source of niacin, riboflavin, thiamin, biotin and vitamin B6 – all of which are necessary for healthy vision and formation of red blood cells. It is also a potent source of Calcium and vitamin A, D and E which are important for bone growth and development. Fruit sushi is a fun and innovative way to introduce more fresh fruits into your kid’s diet. This recipe is quick and simple and it requires no baking or cooking. 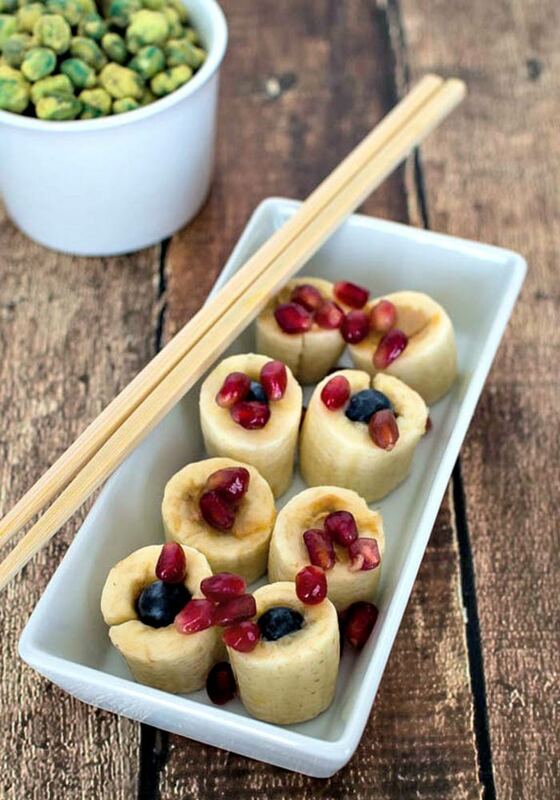 The refreshing and delicious taste of the fruit sushi makes it the perfect dessert or appetizer for your kids. The combination of tangy strawberries, creamy bananas, chewy blueberries and crunchy pomegranates crate a blend of fresh fruity flavors and adds a refreshing fruity twist to the classic sushi. The most important thing about this recipe is that is does not make use of spice or oil which makes it perfectly suitable for kids. Bananas act as an instant source of energy for kids that help to keep them active and running. Potassium in bananas strengthens the bones; improve eyesight and increases brain powder. Folic acid found in strawberries is extremely important for infants and toddlers because it produces red blood cells and aids brain development. Pomegranate helps to kill intestinal worms and cure infections in kids and toddlers. It also helps to treat dental problems in kids and provide protection from gingivitis. It is no secret that kids love anything with chocolate in it, and this delicious and easy chocolate pudding is no exception. This recipe makes use of protein packed silken tofu and honey instead of flour, sugar and eggs which notches up the health quotient of the dessert. It is exceptionally simple, light and filling at the same time and it takes just 5 minutes to put together. All you need to do is put all the ingredients in the food processor and blend it until smooth. Cover and chill in small containers. The use of tofu and honey instead of regular flour, eggs and sweetener improves the health quotient of this dessert. Tofu is a great source of calcium, protein and iron for kids with lactose intolerance. Protein is essential for growing children while calcium is an indispensible mineral for developing strong and healthy bones and teeth. Honey should not be given to children below the age of 2 years. The vitamins and amino acids in honey aid physical development, promotes faster healing of wounds and controls cough. Kids are more attracted to foods with quirky and fun appearance and these bite-sized cucumber sandwiches are a fun snack that your kids can nibble on after school or late in the afternoon. The combination of fresh and healthy ingredients such as cucumber, avocado, tomatoes, cheese and chicken makes a great alternative for French fries and chicken nuggets. It is absolutely filling and wholesome which helps to those little tummies satiated for a long time. It is a non-spicy, non-oily and gluten-free recipe which makes it suitable for kids with gluten intolerance. Cucumber is a nutrient and water-rich vegetable that prevents dehydration and ensures healthy vision and good hemoglobin count in kids. Vitamin K in cucumber promotes blood metabolism and blood coagulation. It also helps to keep your kids energetic and active. Chicken is a great source of non-dairy protein that is essential for growth and development of the kids. Kids love noodles and they can eat it all through the day – breakfast, lunch and dinner. So, here is a easy and healthy zucchini noodles recipe that makes use of zucchini instead of regular spaghetti. It requires absolutely no cooking or baking and is a great way to introduce more vegetables in your kid’s diet. It is purely vegan and gluten-free which makes it suitable for kids with gluten intolerance. You can also use other vegetables such as cucumber, carrot or pumpkin for the noodles. The use of zucchini instead of classic flour noodles adds a healthy twist to the dish. The use of avocado pesto instead of other heavy sauces or cheese helps to cut out the empty calories from the dish. Zucchini is a good source of calcium, vitamin C, dietary finer and folate – all of which support and promote growth and development of the kids. It also contains some amount of beta-carotene that supports healthy vision. Avocados are a potent source of essential unsaturated fats that are needed for brain development and absorption of nutrients from foods. It also protects against liver damage in kids caused due to hepatitis and jaundice. Kids are crazy about pizza or anything that has a close resemblance to it. The watermelon feta and balsamic pizza is inspired by the classic pizza recipe and its appearance. The watermelon pizzas are a fun way to include more fruits into your little one’s diet. It makes a perfect breakfast or snack that can be enjoyed by your kids as well as the whole family. The delicious feta, olives and mint toppings adds some nice flavors and texture to the juicy watermelons. This is an ultimate healthy snack that includes all whole ingredients – fresh watermelon, olives and mint and does not make use of cream or cheese. Lycopene found in watermelons promote the strength of bones and joints in kids. Potassium is an electrolyte that regulates the contraction of muscles and excitation of nerves in your child’s body. Beta-carotene helps to improve eyesight, while vitamin C boosts the immune system. Feta cheese is a rich source of calcium and healthy fats that are necessary for bone development and healthy brain functions respectively. The best thing is, feta is much lower in calories and fat compared to other cheese. There is nothing like a delicious and creamy banana split that gives a yummy start to your day and is loved by your kids. This use of strawberry Greek yogurt instead of ice-cream or whipped cream gives a healthy touch to the recipe. The inclusion of granola and berries packs in some fiber, carb and antioxidant punch into it. You can also serve it as a dessert after a meal. This recipe uses Greek yogurt instead of ice cream or whipped cream which gives it the same rich creaminess minus the calories. Greek yogurt is a great source of protein and active cultures which help to improve digestive health and perk up the immune system. Granola provides an instant boost of energy to your kids so that they can stay active throughout the day. It is a rich source of fiber that helps to increase satiety and prevent unhealthy snacking. Certain components in berries fight off infection caused by bacteria and viruses and supply loads of antioxidants to the body. Can’t make your tiny tots eat up their apples? Here is a quick and yummy apple cookie recipe that takes so good that your kids won’t be able to get enough of it. All you need to do is spread a layer of peanut butter on each of the apple slices topped with nuts, chocolate chips and shredded coconut and your apple cookies are ready to serve. You can serve it as a snack or sweet treat. The healthiest thing about these apple cookies are that they are made with whole ingredeints and not flour, oil and sugar. Apples are a rich source of healthy carbs that provide energy for the children to learn and play. Boron strengthens the bones; pectin increases satiety and vitamin C helps in growth and tissue repair. Both almonds and walnuts are packed with vitamins, minerals, proteins, fibers, healthy fats and antioxidants that help children to grow and develop. The healthy fats found in nuts support brain development. Are you worried that having too many popsicles will add empty calories and sugar and ruin your kid’s health? Worry no more. Here is a delicious and healthy coconut pineapple yogurt Popsicle recipe that is easy to make and will be an instant hit with your kids. The combination of coconut milk and yogurt creates a rich creamy texture while the pineapples add a refreshing fruity taste to it. The coconut milk and coconut extract renders a tropical touch to it. Unlike classic popsicles, the coconut pineapple yogurt pops are not packed with sugar. These pops are packed with protein, healthy fats and fiber. Pineapples are a good source of vitamin C that helps in growth and development, while the dietary fibers help to increase satiety. It also contains mineral manganese that is necessary for maintaining healthy bones and cartilage. Coconut is a rich source of monounsaturated fatty acids that aids in creation of hormones in children and helps in better absorption of vitamins from foods. These chewy and delicious protein balls made with chickpeas and almonds are an immediate hit with kids. The combination of chickpeas and almonds packs in a wholesome protein and nutrition punch. It is a wonderful filling snack that keeps your little busy body satiated for a long time and provides energy and stamina to run around all day. The honey and chocolate chips add a nice sweetness to the protein balls while the vanilla renders an appetizing flavor to it. This recipe does not make use of sugar or any artificial sweetener to enhance the taste. It does not make use of oil, cheese or cream which helps to keep it low in calories and fat. The high protein and polyunsaturated fat content in chickpeas is useful for growth and development of toddlers and kids. It is useful for development of muscles and internal organs. It improves brain development, supports good eyesight and aids neurotransmission. Calcium in chickpeas is essential for strong and healthy bones. The alkali materials in almonds strengthen immunity and reduce the risk of infections while riboflavin and L-Creatinine supports brain development and nervous system. Metals manganese and copper found in almonds work as energy boosters. The peanut butter, banana and honey roll ups are a delicious snack for the kids when they return home from school. The use of whole wheat or multigrain flat breads adds some filling fiber and protein into the snack, while the creamy peanut butter and honey combo make it all the more appetizing. The banana renders some nice fruity flavors and essential vitamins and minerals into the dish. The peanut butter, honey and banana filling make a healthy combination that supplies a considerable amount of essential nutrients. The best thing about peanut better is that it is loved even byt he pickey eaters. It is a good souce of protein, B-vitamins, iron, folic acid and fiber along with monounsaturated fatty acids – all of which support physical development of the kids. Are your kids bored with the same old chicken sandwiches? Add an interesting twist to the recipe with this delicious and healthy Green Tzatziki Chicken Salad served in pita bread. The flavorful combination of Greek yogurt, lemon juice, herbs and garlic makes a healthy and delicious alternative to mayonnaise. The chicken adds some high-quality protein and fiber in to the salad making it healthy and filling. The combination of chicken, feta, Greek yogurt, tomatoes and cucumber helps to supply a substantial amount of protein, fiber, vitamins, minerals and healthy fats to your kid’s diet. Greek yogurt is great for your growing kids because it is rich in calcium, probiotics and protein. With calcium and protein supports growth and development of bones and muscles, probiotics support digestive health and boost immunity. Cherry tomatoes are a good source of vitamin A, vitamin K and antioxidants that support the development of eyes and strengthen the bones. Tomatoes also work as a remedy for acidosis and lead toxicity in children. The Mediterranean Tuna Lettuce Wraps are a delicious, quick and healthy no-cook dinner idea for your kids and a fun way to introduce more fish into their daily diet. The blend of tuna, chickpeas, feta and tomatoes creates a nice chewy texture which goes well with the crunchiness of the lettuce wraps. The olives and fresh mint enhance the flavors and add a Mediterranean touch to the dish. The combination of tuna and chickpeas in the filling helps to pack in a variety of nutrients in your kid’s diet such as lean protein, healthy fibers, healthy fats, vitamins and minerals. Tuna is an excellent source of high-quality protein, selenium and omega-3 fatty acids that help in physical development and healthy brain development in kids. It improves cognitive functions and boosts oxygen circulation throughout the body. Bell peppers are a potent source of vitamin C, E, A and B6 which strengthen the immune system and help to fight off bacterial infections, improve eye sight and aids brain development in your child. The wholesome and creamy overnight oats in three different flavors makes a healthy, delicious and flavorful breakfast of the kids as well as the entire family. The best thing about this dish is that you can add the ingredients, flavors and toppings as per the choice of your kids. It tastes yummy and keeps the little tummies filled and satisfied till the next meal. The oats pack in some healthy soluble and insoluble fibers into your kid’s diet. The combination of oats, yogurt, coconut milk, nuts and berries creates a healthful breakfast recipe that is loaded with fiber, healthy fats, antioxidants and protein. Oats is an easily digestible food for toddlers and kids which supplies considerable amount of energy. It is a good source of vitamins and minerals such as thiamin, niacin, folate, vitamin K, vitamin E, calcium, iron, phosphorus, magnesium and potassium – all of which promotes various activities in the body that aid growth and development of the child. The fiber in oats makes it a mild laxative that prevents constipation in children. Serve anything topped with cooked eggs and it becomes instantly appetizing and delicious to kids. This smoked salmon sandwich topped with eggs is a delicious and healthy recipe and a n easy way to introduce more fish into their diet. The use of whole grain rye bread adds some fiber and makes it filling. The rich and creamy avocado is a wonderful substitute for cheese, butter and cream. The combination of salmon, eggs and avocado supply a wholesome protein punch to the sandwich along with some healthy fats. This recipe does not include any spices, oil, cheese or cream which helps to keep it light and simple. Salmon is by far the best source of omega-3 fatty acids which improves cognitive function in children. The omega-3 type known as DHA are a critical component of brain cell membranes. These healthy and yummy carrot cake protein barks taste exactly like fluffy and soft carrot cake but it involves not cooking or baking. It is jam-packed with fiber, protein, vitamins and minerals but extremely low in calories. 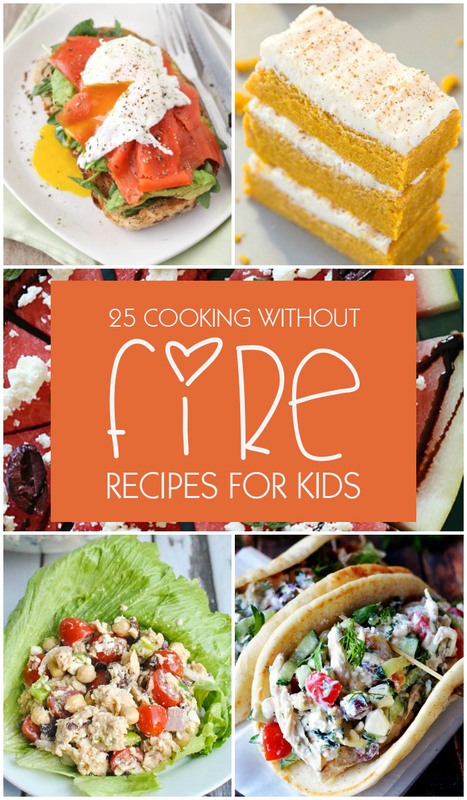 It is absolutely gluten-free and suitable for children with gluten intolerance. You can serve it as a snack or a dessert at the end of meals. The use of oat flour and coconut flour instead of regular flour increases the health quotient of this recipe. Carrots are one of the healthiest of vegetables packed with beta-carotene that improves night vision in kids. The presence of folate prevents birth defects. It is a good source of dietary fiber that improves satiety. Kids love food interesting and innovative appearance and the corn and crab salad tortilla cups strikes the right chords with kids. The delicious and scrumptious corn and carb salad filling in tiny tortilla cups makes up a fun snack for kids. 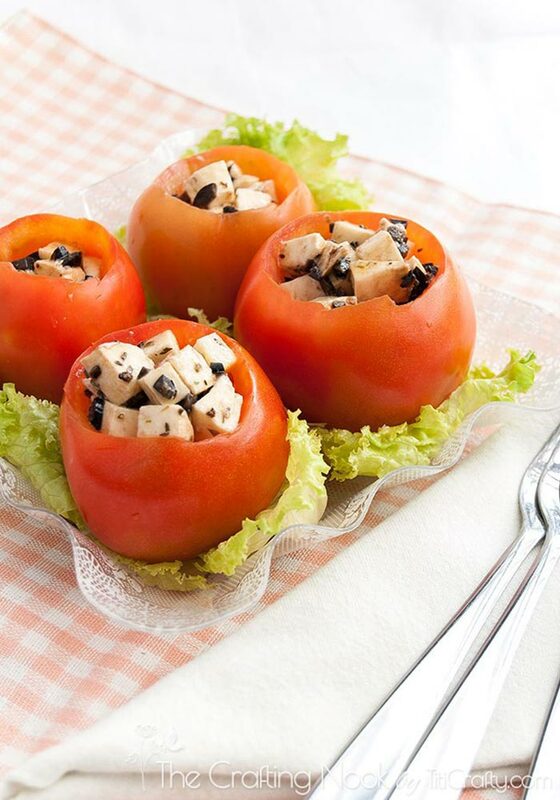 It is a wholesome and healthy appetizer that can be served before a meal. The combination of chewy crab meat, crunch sweet corn and creamy avocado creates a layer of texture. The cilantro, fresh lime juice and olive oil heighten the flavors and taste of the salad. You can cut down on the spices and ignore the jalapenos completely if your kids don’t like spicy foods. The best thing about this salad is that it does not make use of any heavy dressing which keeps it light and delightful. Sweet corn used in the filling is one of the best sources of slow-digested carbs that provide long-lasting energy to your kids. It is also a good source of vitamin C, niacin, folate and potassium that support the formation and maintenance of healthy cells and aid physical growth. This easy and quick tomato mozzarella and basil sandwich is a no-cook, no-bake recipe that can be prepared in just 10 minutes. All you need to do is layer the ingredients n the bread, season with olive oil, spices and salt and enjoy it. This sandwich can be eaten as it is or grilled in a grill. The seasoning of olive oil and garlic powder along with the smell of fresh basil adds some appetizing Italian flavors to it. The sandwich makes use of simple seasoning – olive oil, salt, pepper and garlic powder and does not include any heavy cream or sauces which keep it light and simple. Mozzarella is a rich source of calcium and vitamins A, D and E which helps in strengthening the bones by promoting calcium absorption. It also aids cell membrane protection. It is also a great source of protein and phosphorus that boosts muscle strength, enhances energy and relieves muscle fatigue in children. This is one of the easiest and simplest no-cooking food recipes for kids that require only 3 basic ingredients. These roll ups make use of turkey spices instead of bread with gives it a healthy edge. The combination of turkey, avocado and hummus creates a power packed combo of protein, fiber and healthy fats. The nice chewy and creamy texture of the roll ups is sure to become an instant hit with kids. These easy and simple turkey avocado roll ups are extremely low in calories and fat because it does not include any oil, cheese, cream and spices. Just like chicken, turkey also packs in quite a protein punch that is essential for growth, development and recovery of muscles and tissues. It also helps to boost energy and relieve weakness. Niacin and vitamin B12 found in turkey boosts brain powder. Is it difficult to convince your fussy eater to eat his/her daily serving of veggies? Not anymore. These delicious and flavorful vegetable tortilla roll ups with cream cheese filling will be loved even by picky eaters. It tastes as good as a vegetable pizza and can be served as a snack or as a lunch or dinner. The combination of fresh broccoli, cauliflower, carrots and bell peppers in the filling gives it a nice crunchy texture. The assorted fresh vegetables such as broccoli, cauliflower, carrots and bell peppers provide a powerful nutrient punch to the recipe. Broccoli is a super food for both kids and adults because it is a great source of vitamin C. This antioxidants vitamin plays an important role in boosting the immune system and improving resistance of various diseases. Vitamin A in broccoli develops good eye sight in kids, while iron supports hemoglobin formation. Just like broccoli, cauliflower is also an excellent source of vitamin C. It also contains folate and dietary fiber that supports the development of red blood cells; aids proper brain functioning and support digestive health. This overnight chia seeds pudding made with wholesome ingredients make the perfect breakfast for your kids. The thick creamy texture and delicious taste of the pudding will be loved by your kids. This recipe makes use of 5 to 6 basic ingredients and can be put together in a jiffy. All you need to do is pour in all the ingredients in a bowl, whisk well and refrigerate overnight and your instant breakfast pudding is ready to serve in the morning. The best thing about this chia pudding is that it does not make use of refined sugar or artificial sweetener to enhance the taste. The choice of healthy toppings such as fresh berries, granola and chopped nuts increase the health quotient of the recipe. Chia seeds are a great source of protein that is essential for your kids because it helps in building and maintaining muscle mass and organs. It is a source of sustainable energy and dietary fiber that helps to keep your kids satiated. The omega-3 fatty acids in chia support brain development and good eyesight. Substitute the readymade dips with this wholesome, healthy and flavorful cottage cheese and spinach dip and see how your kids enjoy it with their favorite chips, crackers and vegetable sticks. It requires absolutely no cooking. All you need to do is put together the ingredients in a large mixing bowl, stir it well to combine and serve with tortilla chips, rice chips and crackers. The most important thing about this cottage cheese and spinach dip is that it is prepared from all whole foods that make it delicious and low in calories. Cottage cheese is low in calories and high in protein. A half cup serving of cottage cheese contains 15 grams of protein. It is a rich source of calcium which is essential for maintaining bone and teeth health in growing kids. Being a fresh milk product, it is low in low in sodium, preservatives and additives. Spinach is a terrific leafy green for enhancing eye health in kids. It contains beta carotene, lutein and vitamin E – all of these nutrients help to improve vision. Biochemicals and enzymes in spinach cures gastric disorders, promote liver protection and kills intestinal worms in children. This rich and creamy dessert bursting with refreshing mango flavor will be an instant hit with the kids. This recipe is extremely simple and makes use of 4 or 5 basic ingredients which helps to bring out the tropical flavors and taste of the mango. The use of coconut milk in this recipe enhances the richness and depth of flavor. This dish can be serves as a dessert after a meal or a refreshing snack during a hot summer afternoon. The use of coconut milk instead of plain milk helps to add some healthy fats and nutrients to the dessert. Mango is an easily digestible fruit for kids and toddlers and it is especially advantageous because it is a rich source of enzymes and Biochemicals that promote digestion. Mangoes fight microbial infections and reduce the frequency of common colds, rhinitis and sinusitis in kids. High beta-carotene content in mangoes strengthens the immune system, while vitamin B6 improves brain functioning, memory and concentration. Coconut milk is a good source of vitamins and minerals such as vitamin C, thiamin, niacin, vitamin B6, folate, vitamin E, iron, magnesium, potassium, phosphorus, sodium, zinc, copper, selenium, etc along with healthy fats that eliminate nutritional deficiency and promote brain development. Antimicrobial properties of coconut milk fight against viruses and bacteria and kills intestinal worms. Do you seem to be running out of healthy and tasty finger-food ideas for your kids? Here is a delicious savory and salty mixed nut recipe with a bonus fresh-herb kick that will be loved by the kids as well as the rest of the family. The use of fresh rosemary and thyme blends well with the nutty flavor of pecans and cashews. These herbed nuts are so delicious that you can even make a batch and use it as a holiday gift. The minimal use of spices and oil gives a healthy twist to this spiced nuts recipe. Nuts of all kids including pecans and cashews make a healthy snack option for kids. Nuts are rich in healthy fats, vitamins and minerals that make them a healthier alternative to potato chips, Fresh fries, chicken nuggets and microwave snacks. Nuts are a rich source of vitamin E, fiber, protein, B-vitamins, calcium, iron, zinc, potassium and magnesium. Preparing a nourishing snack or meal for your little ones need not be a lengthy and elaborate task. Cut it short with these delicious and fun no-cook recipes without compromising on taste or nutrition.